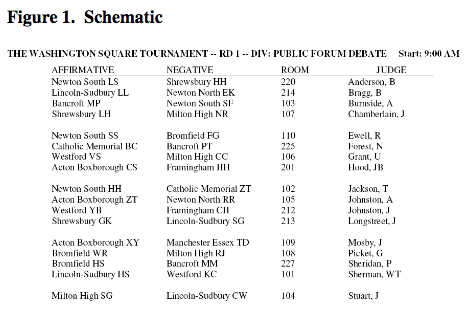 Public Forum Debate (PFD) involves two teams, each with two students, debating an issue of current interest or policy. A judge decides which two-person team wins the debate. Public Forum debaters across the nation debate the same issue, referred to as the resolution, for one month. One side, the PRO, argues that the resolution is true, while the other side, the CON, argues that it is false. What happens at a tournament? schematic (Figure 1) lists: (1) the two teams debating, (2) the room where the debate will take place, and (3) the judge. What happens in a debate? The debate consists of a series of speeches delivered by each side. The debaters also engage in “cross-fire”, during which debaters from the opposing teams question each other. 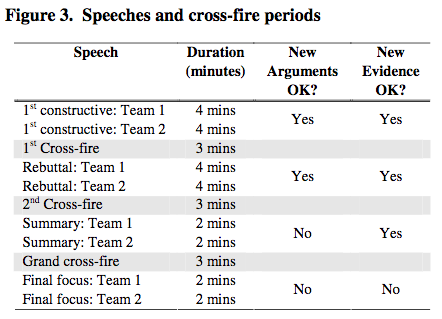 (Figure 3) summarizes the sequence of speeches and cross-fire periods during the round. This information also appears on the ballot. (Figure 3) also summarizes the guidelines on when new evidence and new arguments can be made in the round. These speeches, which are typically prepared before the round, stake out the basic position for each side. Debaters will advance two or three reasons why you should support their side of the resolution. They may also define critical words in the resolution to help frame the debate. The speakers who delivered the 1st constructives take turns questioning each other. The purpose of cross-examination is clarification, not argument; the questioner should always question and avoid statements. 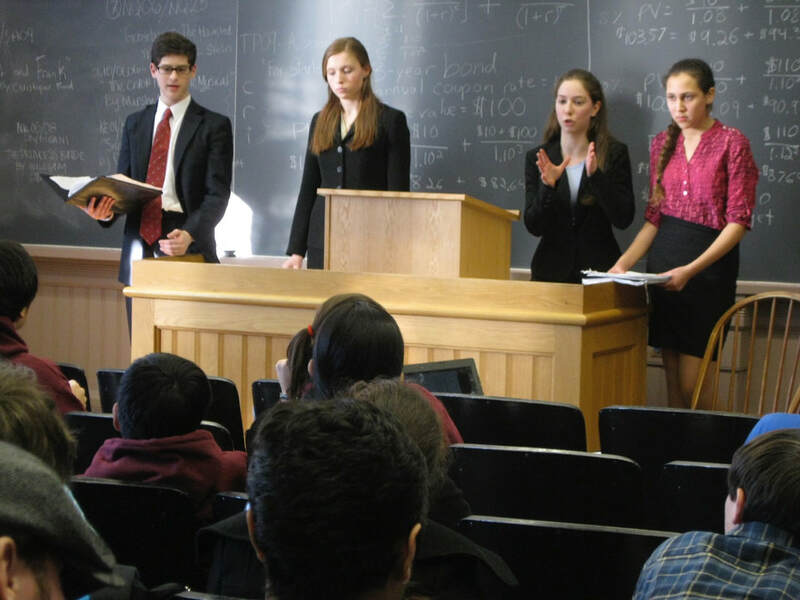 These speeches, delivered by the debaters who have not yet spoken, typically attack the case presented in first constructive by their opponent. The Team 2 rebuttal may also respond to attacks made in the Team 1 rebuttal. The speakers who delivered the rebuttals question each other. Each side identifies and defends key points in the debate. The summary speech can introduce new evidence but cannot introduce new arguments unless they are in response to opponent arguments introduced in rebuttal. Restricting the introduction of new arguments in summary helps ensure that the opposing team has sufficient opportunity to respond. Use your judgment to determine if arguments in summary are new, and if so, if their introduction is valid – i.e., has the argument been introduced in response to a new argument in the opponent’s rebuttal. If the argument is new and not validly introduced, disregard it. All debaters engage in a four-way question-and-answer session. Each side explains why they have won specific arguments and why winning those arguments implies that they have won the debate. Final Focus should introduce neither new arguments nor new evidence. The new evidence prohibition can be relaxed if the new material is presented in response to a first request for that evidence made in the opposing team’s summary speech or during grand cross-fire.